(pregnant) at left, male at right.Owned by Miss Gold, an English breeder. Source: Wade, 1934. Click on photo to see larger image. Although Siamese cats appear to have been bred in Ancient Siam for at least several hundred years, very little is now known about the appearance of the native Siamese cats and how the Siamese people went about breeding them. If the Thais ever had a formal Siamese breeding program, it appears to have ended before the mid-20th century (see Baker, 1951). That doesn't mean that later residents of Thailand did not sometimes own cats of the Siamese pattern, but it does mean that Siamese cats from documented, purebred Thai lineages dating back several hundred years do not longer exist. Possibly they never did. Instead, randomly bred cats carrying the Siamese mutation may have been for a few centuries merely more common in Thailand than elsewhere. Cats of many different colors and body types can be found on the streets of modern Thailand. Some have the kinked tails that were seen in the first Siamese cats imported into the West, but usually in combination with very UN-Siamese coloring. The cat fancy as we know it today was born in England, and the early English cat breeders imported Siamese cats during the 19th century. According to legend, the Thais were still breeding them back then, though all the lovely stories about cats given to British citizens by the king of Siam seem to be unsubstantiated. For instance, there is a widely quoted tale about the king of Siam giving a pair of Siamese to a British vice-consul, who in turn brought them back to England and gave them to his sister Mrs. Veley. True enough Mrs. Veley was among the first Western Siamese breeders and ample documentation shows she owned a pair of Siamese brought back from Siam by her brother in 1884. But Mrs. Veley later wrote that her brother had bought at least one of her two cats for a trifling price from someone in Siam—apparently a street vendor, not the king of Siam. One thing is for certain: cats of Siamese "pointed" coloring could readily be found in 19th century Siam and were described in ancient Siamese cat poems, but they were rare outside of the Orient. 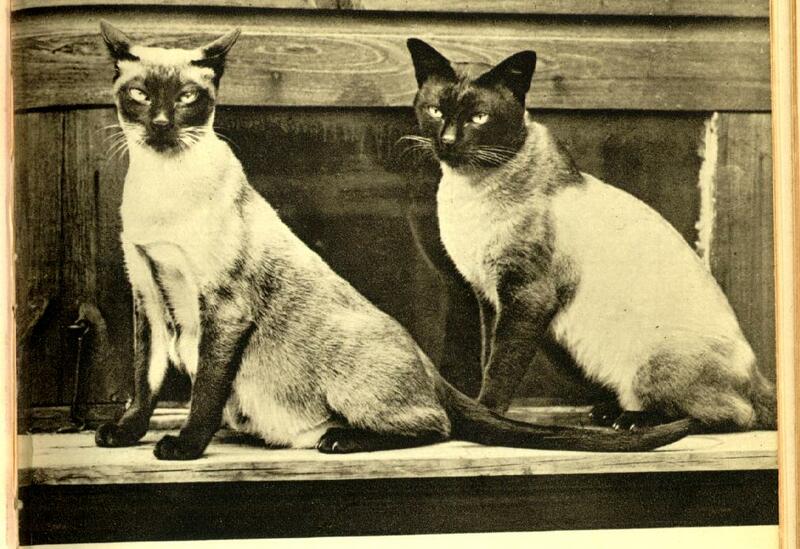 The earliest known Siamese imports were during the 1870s, but were apparently not used for breeding. All pedigreed Siamese cats today are descended from roughly about eleven cats that were imported into England from Siam (Thailand) beginning in the 1880s. Some new blood was introduced later in the 20th century, particularly after the world wars when Siamese cats were in danger of extinction, but the original eleven were the true foundation of the pedigreed Siamese we know today. For details about the ancestors of our pedigreed Siamese cats, we have to examine written records, photographs, and eye-witness testimony describing the original English Siamese. There exist today only a few photographs of the original cats and their first generation descendants. Many of the cats were not photographed, or their photos did not survive to the present. Some of the few that did survive show robust, round-cheeked cats that some people call "appleheads." For example, take a look at this photo of Tiam O'Shian IV who was imported from the Orient in 1886 by Mrs. Vyvyan. Bear in mind that a single photo only shows a cat from one angle and photography can telescope certain features, make them flatter than they are, which makes it difficult to know exactly what the length and shape of Tiam's head and body might have been in the living cat. Also, Tiam was an unneutered male and therefore had stud jowls. See the section about appleheads for more about stud jowls and head shape. We only know for sure that Tiam O'Shian IV was much bigger, more substantial, and less extreme in type than modern show-style Siamese are today. Judging from the photos, there was a lot of variability in the early cats. Here is a photo of Champion Wankee, who was the first Siamese anywhere to become a show champion. Wankee was a very big robust boy, yet he clearly had a long body and a broadly wedge-shaped head with a longish muzzle. Champion Wankee was imported from Hong Kong in 1895 by Mrs. Robinson. Now if you want to see how much the camera angle can telescope a cat's features, compare two photos of Wankee, one taken close up at side view and another photo of Wankee that was taken head on. Notice the little notch in the cat's ear in each photo. It is the same cat. 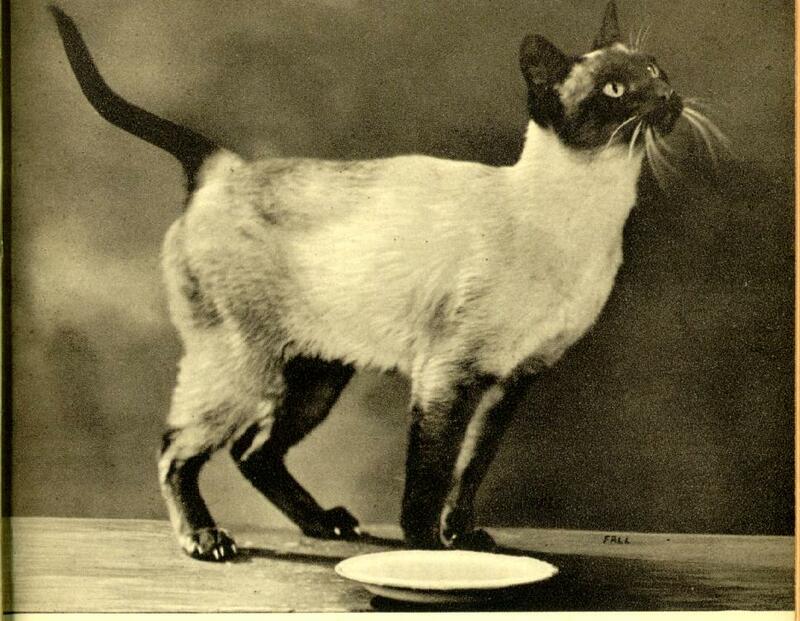 Here is one of the earliest American Siamese champions, Siam de Paris. In the photo, Siam was a mature stud and, like Tiam O'Shian IV above, had stud jowls. Note that he nonetheless had a distinct muzzle and therefore an underlying modified wedge head. He also had a slightly elongated body. But again like Tiam, he was a much bigger, more substantial, more moderate-looking cat than are the modern show-style Siamese. For yet another look, examine this photo of Ah Choo. Ah Choo was the daughter of Tiam O'Shian III (imported). You can see that Ah Choo was a substantially built cat with rounded cheeks. She did not look ultra-slender or extremely elongated like today's modern Siamese. However, note that her head was slightly long and was definitely a modified wedge head. To get some idea what Ah Choo might have looked like in a color photo, take a look at this photo of Sarsenstone Teddy next to Ah Choo. 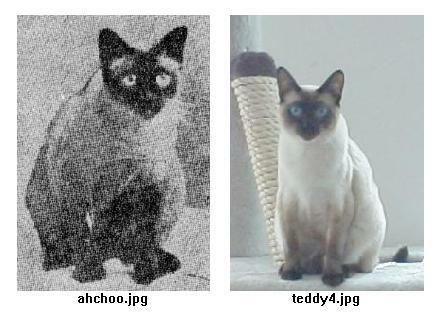 Teddy was born almost 100 years later than Ah Choo, but he is an Old-Style Siamese and the resemblance is uncanny. Now here's what Teddy looks like in a clear close-up photo. Possibly Ah Choo would have looked a bit different than Teddy in a close-up photo or possibly not. It looks like she may have had a slightly longer head than Teddy, though the width of head and bone structure of the body seem much alike. 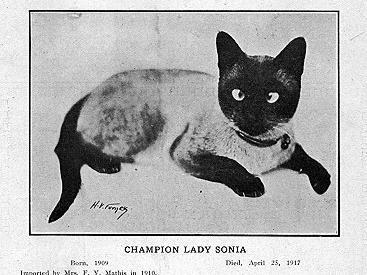 Here is Champion Lady Sonia, who was one of the earliest American Siamese champions. Sonia was born in 1909, the offspring of one of Lady Beresford's Siamese, and was probably within two generations of an original import. You can see that Sonia had a rounded look, but if you have a good eye for type you can see that Sonia was much more petite than the likes of Wankee or Tiam O'Shian IV and she did seem to have a rounded modified wedge head. She was also very cross-eyed, a trait that was more common back then than it is now. English breeder Mrs. Veley, who owned two of the original Siamese cats, wrote that there were actually two body "types" of Siamese among the imports. One type was round and robust - obviously the "applehead." The other type, said Mrs. Veley, was "slim-line" in build and had a "marten-face." Was she talking about cats such as Ah Choo or was she referring to some modern-type Siamese of which there are no surviving photographs? Body type is polygenically inherited. That means that it ranges along a continuum, just like height in humans. There really aren't just two types of humans, Tall and Short, and probably there weren't exactly two types of Siamese either. There was probably a lot of variation in build, with lots of overlap. Most Siamese cats probably fell somewhere in between very chunky and very slender, also somewhere between very large and very small-boned, and between very large and very small in overall size. Mrs. Veley just happened to have two Siamese that were relatively far apart from each other in the Old-Style Siamese continuum. Mrs. Veley said that her cat Pho was a "slim-line" kind of Siamese and her cat Mia was a robust kind. We don't have photos of Pho and Mia, but we do have photos of three of their kittens. The kittens seem to be moderate-looking, round-cheeked Siamese, but they do have modified wedge heads. That's why the mask, or dark area, on their faces forms a rounded triangle. The face is wide at the cheeks and narrows toward the nose. Siamese continued to be imported during the early 20th century. 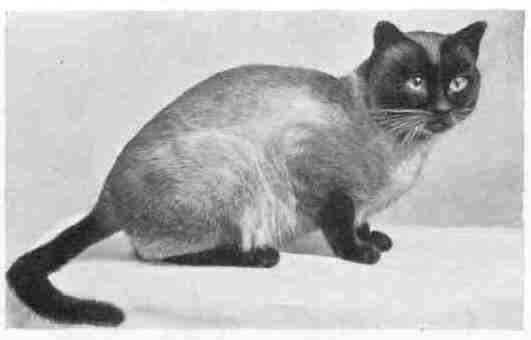 In 1919, Greta Hindley and her husband shipped a female Siamese named Puteh from Malaya to England. Puteh was the foundation queen of Prestwick Cattery, a cattery that lasted for decades and had a strong influence on the Siamese breed. Puteh was described as having a very white body and a narrow head. Presumably her head was merely relatively narrow - as compared to some of the other early 20th century Siamese. We don't have any photos of Puteh, but we do have lots of photos of other Prestwick cats, including Puteh's daughter, Champion Prestwick Perak. 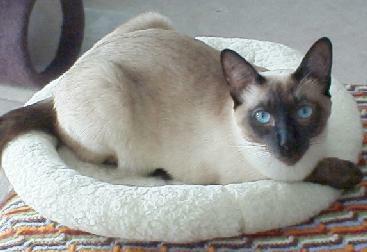 As you can see, Perak was a medium-sized, medium-boned Siamese with a modified wedge head. The earliest Siamese breed standards described the wedge-shaped head as an ideal or epitomal feature of the Siamese breed. Greta wrote that Perak had the perfect Siamese head, at least as it was envisioned at the time. The modern Siamese now seen in show rings have much narrower, much longer, much more triangular heads than little Perak had. Every photo of the early Prestwick cats shows cats that were medium in bone structure and had Perak's type of modified wedge head. The historical records describe the Prestwick cats as having unusually deep blue eyes and tails that were either long or shortened and bent by kinks. Tail kinks, like crossed eyes, were another common flaw in early Siamese cats. The first imports into the United States occurred at least several years prior to 1900. Some early imports may not have been recorded. Those used for breeding appear to have come from the offspring of the English Siamese, not directly from Siam. We know that the first American Siamese breeder's club to survive long was the Beresford Club. This club attempted to begin a registry and published a stud book in 1900. The registry was subsequently inherited by the American Cat Association, the oldest pedigreed cat registry in the United States today. The Beresford Club Stud-book and Register of 1900 provides the first clear record of Siamese cats imported into the United States and definitely used in a breeding program. The first two Siamese cats recorded were Lockhaven Siam and Sally Ward, owned by Mrs. Clinton Locke. The Beresford stud book also contains photographs of Lockhaven Siam and his son Lockhaven Chom. 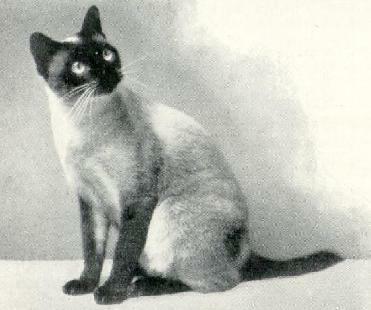 Author and well known Siamese fancier Hettie Gray Baker saw those photographs and wrote in 1951 that Siam was a robust and broadly built cat, but that Chom resembled the finest quality Siamese of Hettie's time (1930s-1950s). By that Hettie probably meant that Chom was a moderate but more lightly built Siamese similar to her own cat Mikado of Fleet (see Baker, 1951). Mrs. Robert Locke, not to be confused with Mrs. Clinton Locke, obtained three Siamese: Calif, Siam, and Bangkok. 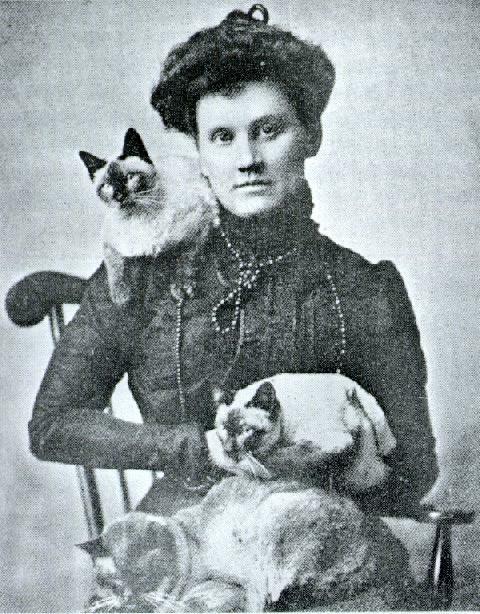 You can see that the cats on Mrs. Robert Locke's shoulder and in her arms were lighter built Siamese, whereas the cat lowest in the photo had a much more robust build. But all three were of moderate Oriental type. There are no modern, ultra-Oriental, ultra-slender, ultra-slim Siamese to be found in any 19th century or early 20th century photograph. The first photographs of the extreme modern Siamese do not occur until after World War II and they do not become frequent until the 1950s and 1960s. Numerous books were published about Siamese cats from the 1950s onward. 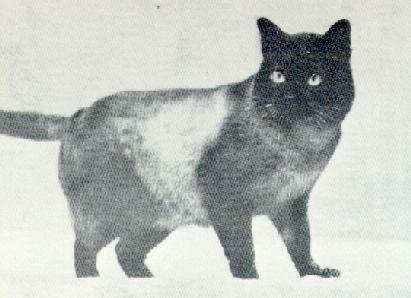 Although modern Siamese were in the show rings by then, most of the show champion cats depicted in these books are still similar to the influential early 20th century Prestwick type of Old-Style Siamese. Some of the heavier-built Old-Style Siamese, the ones similar to Wankee or Tiam O'Shian IV, are also consistently seen. A photograph of one of the first cats to possess concurrently the extreme elongation, fine bones, and narrow wedge head of the modern Siamese is seen in a book by American Siamese breeder Marge Naples and published in 1964. The cat is Fan-T-Cee's TC, a widely admired and much used stud. 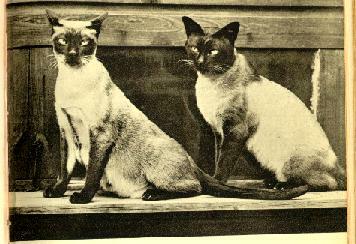 Nonetheless, photos showing modern Siamese are not common in cat books until about 1980. Taken together, these data strongly suggest that the moderate looking Old-Style Siamese were predominant until the late 20th century - and that they varied in build along a continuum from medium-sized, medium-boned, medium slender, and moderately elongated to large-sized, large-boned, meaty, and barely elongated. Many cats were intermediate or "mix and match" with regard to these traits. Probably most, if not all, early Siamese had modified wedge heads with some rounding of the cheeks and some slight elongation of head, body, tail, or all three. But they do not seem to have been anywhere near as extremely Oriental or as homogeneous in body type as the modern show-style Siamese. In conclusion, the Old-Style Siamese is a pedigreed Siamese cat that resembles moderate-looking Siamese in photos of the first Siamese imported from Siam into England, as well as their earliest descendants, from the period between 1880 and roughly 1945. The Old-Style Siamese varied in build, but were much more substantial than modern Siamese and seem to have had basic Oriental traits, such as a modified wedgeshaped head and mild elongation of body. The modern Siamese was gradually developed from the lightest built, most elongated Old-Style Siamese by selective breeding, a trend that first gained significant headway in the United States in the 1950s. In 1966 Siamese breeder Jeanne Singer wrote a new preface to the CFA breed standard for the Siamese that favored the modern Siamese. The modern Siamese was subsequently bred in ever-increasing numbers and became the most common type of American Siamese in approximately 1980. But Old-Style Siamese still exist and are bred by a few breeders. 1. Franklin, Sally. The Complete Siamese. New York: Howell Book House, 1995, pg. 54, pp. 86-88 (including photographs). At this time, this is the most objective and scholarly book dealing with the Siamese cat—many quotes from primary historical sources. 2. Lauder, Phyllis. Siamese Cats. London: Williams & Norgate Ltd., 1950. Examine the many photographs of early twentieth century cats, especially the "classic" Prestwick Cattery kittens immediately prior to page 49. 3. Denlinger, Milo G. The Complete Siamese Cat. New York: Howell Book House Inc., 1952. See especially: pg. 27 (close up head shot of mid-twentieth century double champion Siamese), pg. 32 (nineteenth century Siamese), pg. 49 (nineteenth century Siamese and early English breeder), pg. 50 (champion Siamese showing emerging modern Siamese head—but no other modern traits), pg. 57 (grand champion Siamese born in 1941), pg. 67 (close up head shot of the regional southern United States Siamese champion in 1950), pg. 82 (close up head shot of mid-twentieth century champion Siamese). 4. Baker, Hettie Gray. Your Siamese Cat. New York: Farrar, Straus & Young, Inc., 1951. See especially: pg. 10, pp. 12-13, and photographs just prior to page 85 (head and body type of the young champion queen 0f 1945). 5. Naples, Marge. This is the Siamese Cat. Jersey City, NJ: TFH Publications, Inc., 1964. 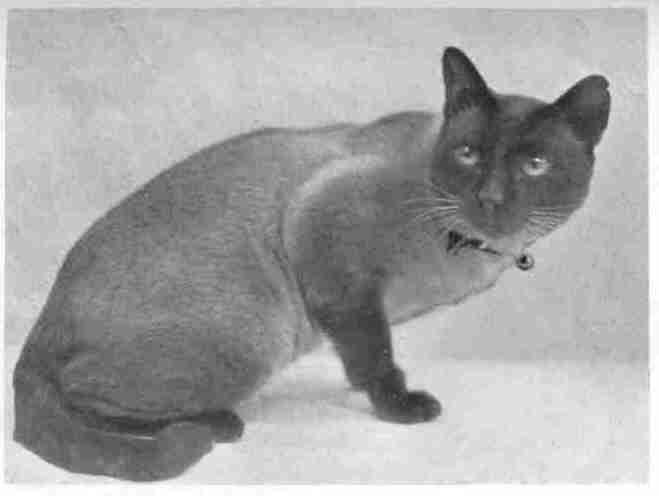 See photographs on title page and on page 12 (first fairly modern-looking Siamese in the old books), pg. 11 (close up head shot of grand and triple champion Siamese), pg. 13 (close up head shot of double grand and quintuple champion Siamese), pg. 14 (grand and triple champion Siamese, interestingly enough from same cattery as cat on title page), pg. 33 (cats from author's cattery prior to 1964 - and see next reference #6). 6. Naples, Marge. Siamese Cats. Neptune City, NJ: TFH Publications, Inc. 1989. Compare photographs of the cats in this book to those in the author's 1964 book. 7. Van der Meid, Louise. Siamese Cats. Neptune City, NJ: TFH Publications, Inc., 1978. See the many photographs of Old-Style Siamese, including show champions, in this book by a well known and long-time photographer of Siamese cats. Only one or two of the photographs show Siamese possessing modern features. 8. Burns, Barbara S. All About Siamese Cats. Neptune City, NJ: TFH Publications, Inc., 1993. On pp. 136-43, the author talks about the change in the Siamese breed standard to favor modern type in 1966, quoting the preface to the new standard. Also, see photographs of Old-Style Siamese on pp. 25, 48, 61, 73, 76, 87, 99, 135, 138, 141, 149, 153. 9. Alderton, David. Cats. New York: Dorling Kindersley, Inc., 1992. Page 18 briefly talks about the evolution of the Siamese and Persian breeds during the twentieth century, including photographs. 10. Wade, Phyl. The Siamese Cat. London: Methuen & Co., Ltd., 1934. Photo between pp. 14 and 15 shows two cats imported into England by Miss Gold, Oriental Minoo Pinklepurr (Old-Style Siamese female, pregnant) and Oriental Nai Tabhi (Old-Style Siamese male). Between pp. 98 and 99 is a clear photograph of Champion Prestwick Perak, an Old-Style Siamese born at the beginning of the 1920s. Between pp. 74 and 75 is a photo of Hoveton Ruler (of Prestwick Cattery), a wonderful Old-Style Siamese stud. Siamese head. Source of photo: Wade, 1934 (see refs above). Copyright © 1996-2012 by Dr. Cris Bird of Sarsenstone Cattery. You may not redistribute it in any form without the express written consent of the copyright holder.